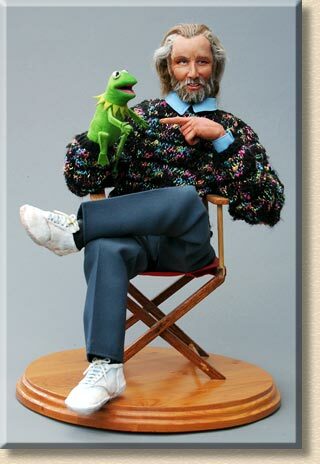 The master puppeteer is seated in his director's chair "talking" to his alter-ego; Kermit the Frog. Media: Marianne's very first portrait head of Super Sculpey. Hands and shoes were sculpted by Martha. He has a cloth body with a wire armature. We spent an entire Sunday afternoon gluing on his hair and beard one strand at time, using bits of mohair, dynel, and human hair. He's wearing a hand-knit sweater, dark pants and white running shoes. Props: He is seated in a handmade wooden director's chair made by Jan Boers. Jim Henson's name is stenciled on the back of the chair. On his right hand, is a miniature version of Kermit the Frog, handmade of green felt. Height: 35 cm (14") seated.